A Palestinian family waits to cross from the Gaza Strip into Egypt through the Rafah border crossing on Saturday. Egypt reopened its border with the Gaza Strip on Saturday, effectively ending a four-year-old blockade. The opening brought badly needed relief to the Palestinian territory's 1.5 million people, but it is likely to deepen Egypt's growing rift with Israel. Egyptian police officers struggled to open the rusted gate on their side of the crossing Saturday morning, as a dozen Palestinians with suitcases pressed close. One of the first to cross back into Gaza was 60-year-old Rokia Saga. "Thank God and thank Egypt," she said, raising her hands in praise before her wheelchair was pushed through. Israel and Egypt under Hosni Mubarak shuttered the crossing after the Islamist militant group Hamas seized control of Gaza in June 2007. The closure plus a naval blockade were meant to weaken Hamas. But all Gazans suffered as their economy ground to a halt. 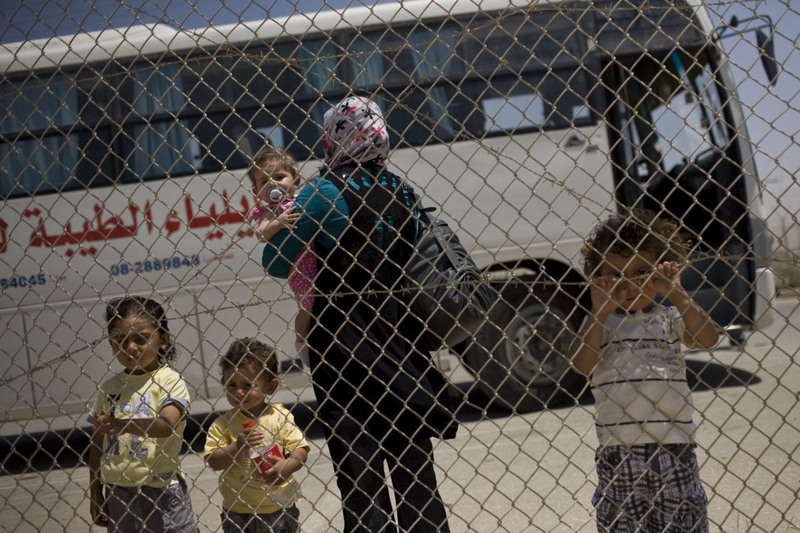 Few Palestinians except for people requiring medical treatment or students were allowed to cross the sealed border. After Mubarak was ousted in February, the new Egyptian government decided to redefine its relationship with the Palestinians. In addition to opening the border, it recently helped broker a peace agreement between the Fatah and Hamas factions. Mahmoud Abu Musaba says he rushed back from Algeria when he heard the crossing would be reopening. He hasn't been home since December. Under the new system, there are few restrictions on who comes and goes. But one Mubarak legacy that remains intact: Palestinian men between the ages of 18 and 40 must get visas before being allowed to enter Egypt, which often requires a background check. "Coming from Canada, to be honest, I'm with security a hundred percent. So whatever it takes, security-wise, that's all I have to say," he said. "But it's sad. I'm Palestinian myself, so yeah, it's a disappointing picture to look at." Officials say the movement of people across the border was smooth. Many travelers say they were pleased, describing the process as dignified and quick, compared to in the past. Buses moved travelers between the Egyptian and Gaza passenger terminals. Still, by the end of the day, only a few hundred crossed from Gaza into Egypt, and even fewer the other way. Some passengers say it was because no one believed the crossing would actually reopen. But those who did cross, like Samah Ahmad, say they felt liberated. "We feel that we are big family. We didn't need the border to separate between us," she said. "It means many things. It means the Egyptians, they really care about the Palestinian case." In the Egyptian town of Rafah, residents like Ra'ad Auda say they do care. He says he's happy the border is open to his Palestinian brothers. It will help them improve their quality of life, he explains. The shopkeeper says it'll also mean more business for him at a time when the Egyptian economy is suffering.